A while ago, I reviewed the original RecoFiT Calf Component Compression Sleeve, a calf compression sleeve that has become my compression sleeve of choice. Recently, Susan Eastman Walton, the owner of RecoFiT who had stumbled across my previous review, emailed me to let me know that manufacture of RecoFiT has been moved to the USA, and that the sleeve has been updated with a hypoallergenic silicone gripper at the top. Updated compression sleeves? Yes, please! Unique sleeve supporting the lower leg’s muscles and circulation from the ankle to the knee. Available in black or white. Proper fit is extremely important for effective compression so RecoFit offers a wide variety of sizes based on the calf’s circumference. If your measurement is on the cusp between sizes, choose the smaller size. 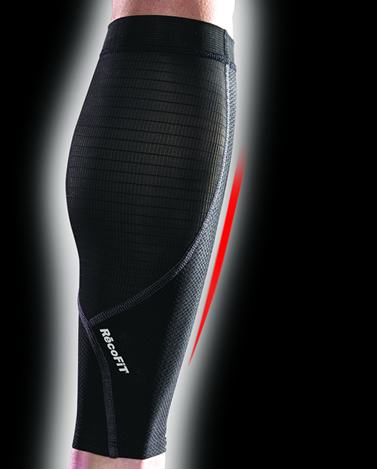 * RecoFit’s calf compression components superior design and materials include GreatFiT ™ -- Gradient Recovery Exercise & Activity Technology -- delivering gradient compression where it’s needed most to reduce negative exercise and travel effects and maximize recovery. Careful pattern-making and construction provide gradient compression from the ankle up towards the knee, helping to return the blood to the heart. * Resistex Negative-ion circulation assistance through Resistex™ carbon yarns increases blood oxygenation and supports the immune system as well as offering ribbed massage, compression, moisture-management and breathability. * Superior materials featuring the finest breathable and most comfortable Italian fabrics and flat-seam construction that do not bind or irritate. The contour and cross-grain-cut of the fabric provides maximum compression benefits. * Versatility and performance: Recofit components are more versatile and specific than shorts, tights or socks. * Left- and right-specific for optimum fit and performance, as well as a wide range of sizes to best suit individual needs. Like the original Calf Component, the new RecoFiT looks deceptively small out of the box. And whenever I get new compression gear, I always forget how hard it is to put on. The updated RecoFiT is no exception. They fit just like the original, meaning they're super compressive. However, despite the tight compressive feeling, they still manage to be comfortable. One thing I really like about RecoFiT that I feel separates it from some of the other compression gear I've worn is the material they use. It's a sheer nylon/spandex/carbon blend that stays relatively cool. It's not as soft feeling if you're picking it up and playing with it in the store, but I definitely appreciate the material when I'm actually wearing it. The new silicone gripper is a nice touch aesthetically, but in practice, I don't really notice it. I never had a problem with the sleeves sliding down when I was wearing them before, so I don't see much of a change in function. To be fair, I wear these exclusively as a recovery sleeve, since I see definite benefits for recovery, but don't notice a performance difference with or without them when wearing them during training or competition (at least for my body...you can read the numerous studies on compression and performance and draw your own conclusions). If you do work out with the sleeves and did have problems with them sliding down, you may appreciate the new gripper. The gripper is pretty tacky, so I'd imagine it would stay in place better than the old sleeve, but since I never had problems with the old sleeve, it's hard for me to compare. If you want more details on the fit or performance of the sleeves, please check out my previous review. Most of the sleeve has remained unchanged. This is fine, in my opinion. They worked how I wanted them to the first time around, so why fix what's not broken? As you may or may not know, I had ankle surgery done in August. The hospital gave me compression sleeves to use in order to encourage bloodflow and reduce edema, but honestly, I used my RecoFiT instead. They both provided similar compression (though the RecoFiT had a little less "give" to it), but the material of the RecoFiT just made them more comfortable, especially in the August heat. Additionally, I have continued to use them in my return to running, and they have curtailed my shin muscle soreness (anterior tibialis for my fellow biomechanics geeks) to just a week (as I stated in the last review, this is something that used to haunt me for months after a layoff). I would recommend talking to your doctor before going this route though, since sometimes you're prescribed a specific compression grade, and RecoFiT does not specify exactly how compressive they are. RecoFiT Calf Component Compression Sleeves are available for $44.95 on RecoFiT's website as well as at select retailers. Additionally, I have been informed by Susan that anyone who "Likes" the RecoFiT Facebook page will be automatically entered into a monthly drawing for a RecoFiT visor! Full disclosure: I received the RecoFiT Calf Component Compression Sleeves free of charge in exchange for a review. While I appreciate their generosity, I do not have any affiliation with RecoFiT, and the opinions expressed in this review are mine and based on my experience, and do not reflect the opinions of RecoFiT or anyone else. Nice review. Though I prefer a full compression sock to just a sleeve. Hi! I've been reading your site for some time now and finally got the bravery to go ahead and give you a shout out from Dallas Texas! Just wanted to mention keep up the good work! Where your dreams become reality?